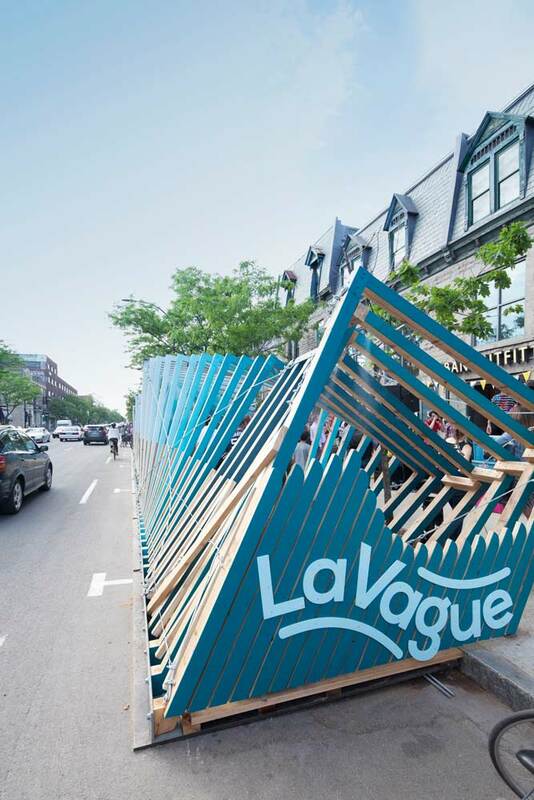 LA VAGUE – A unique refreshing rest stop on St-Denis Street in Montreal. 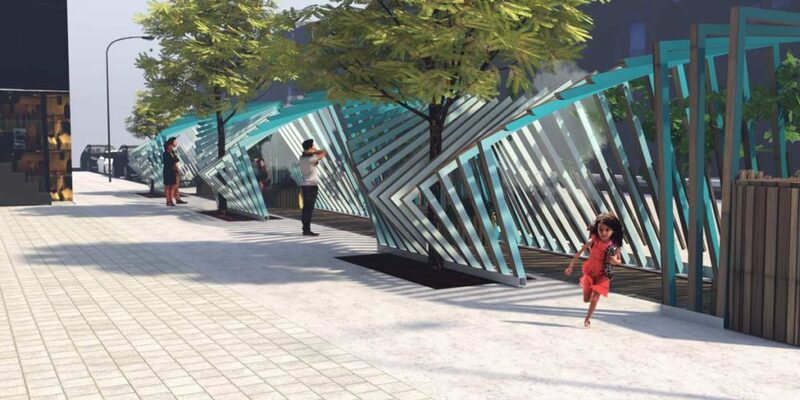 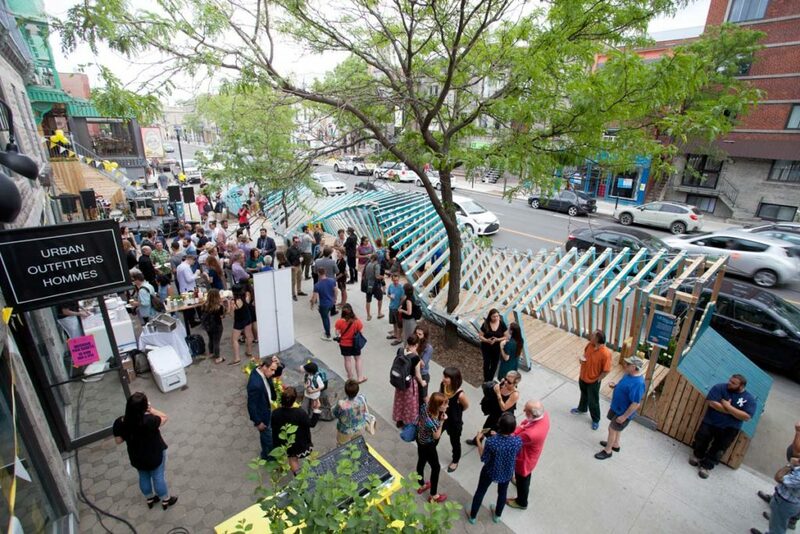 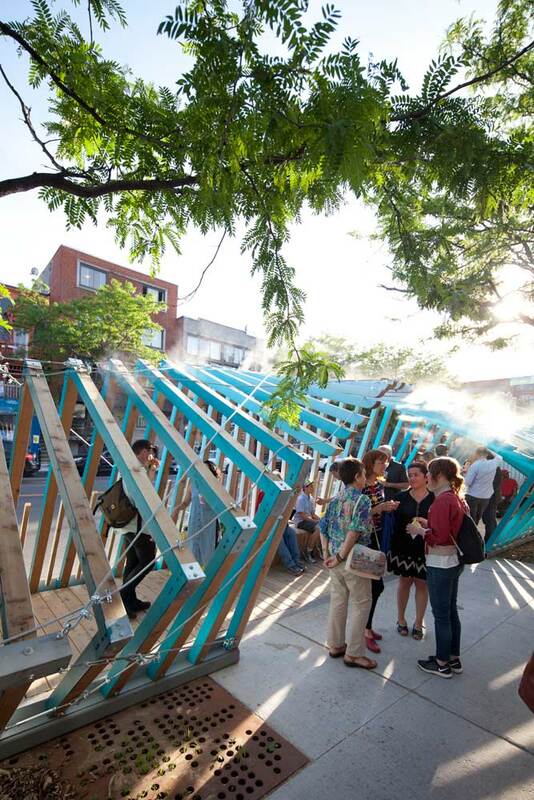 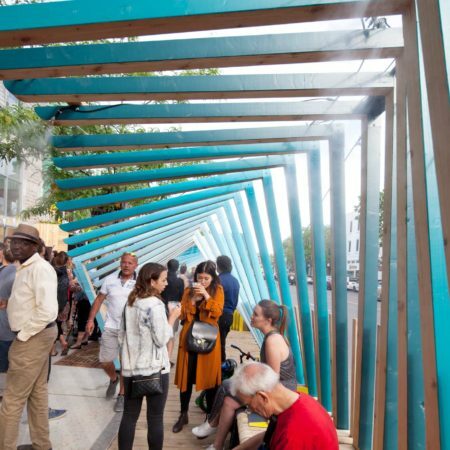 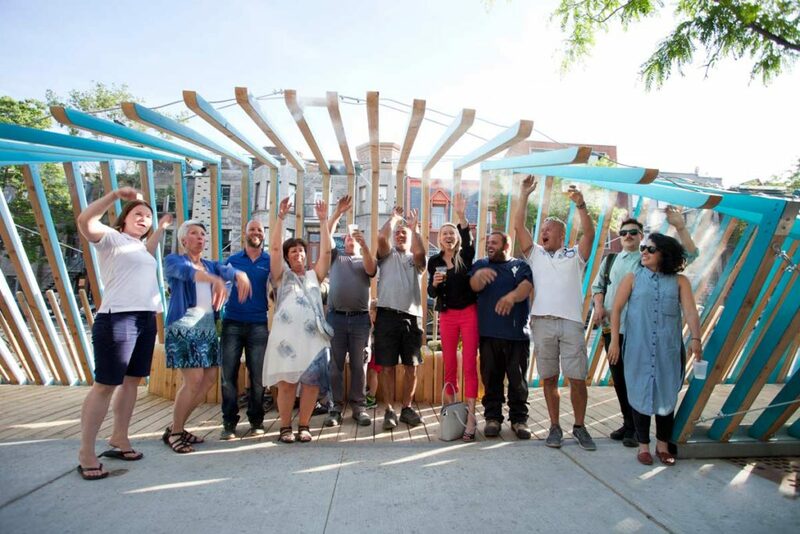 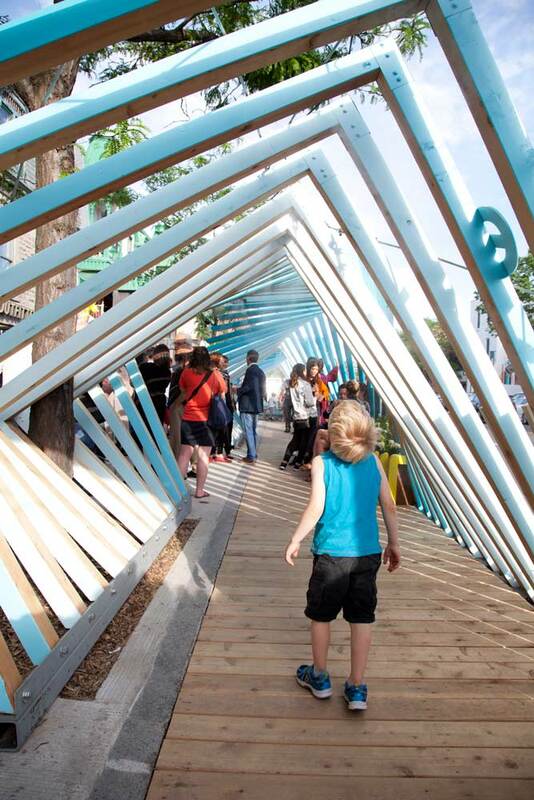 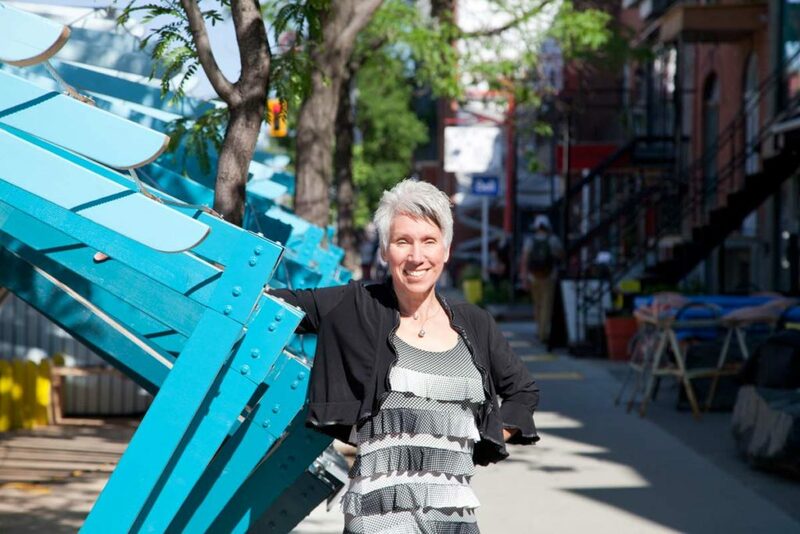 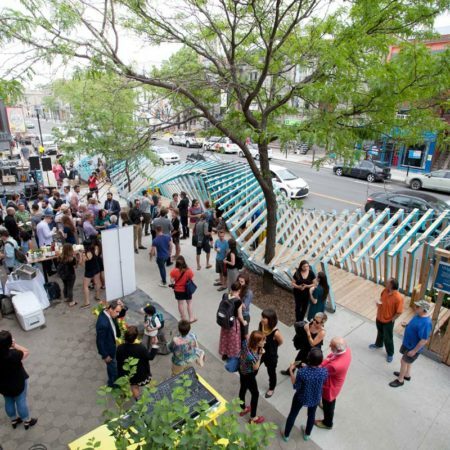 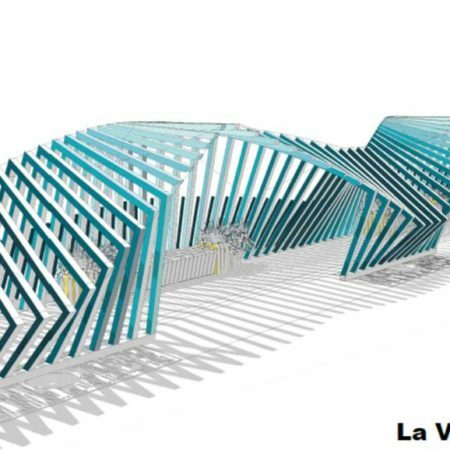 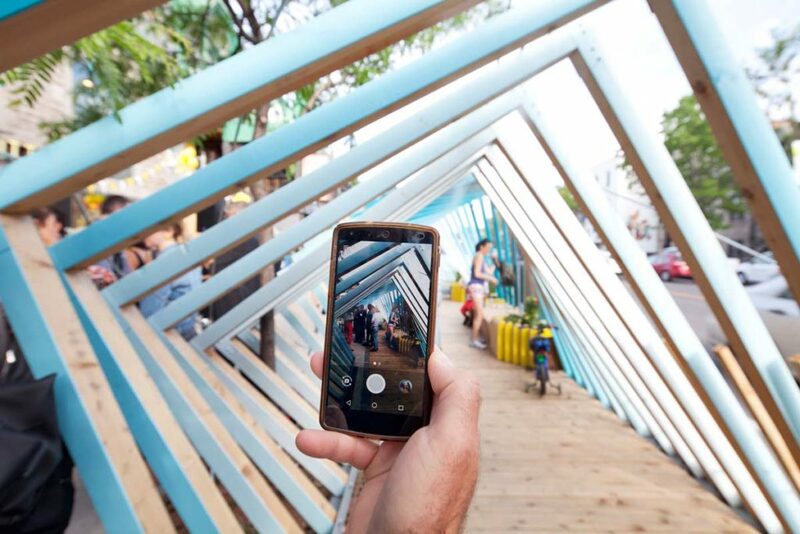 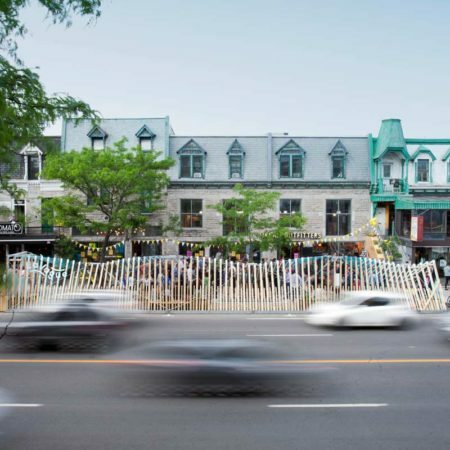 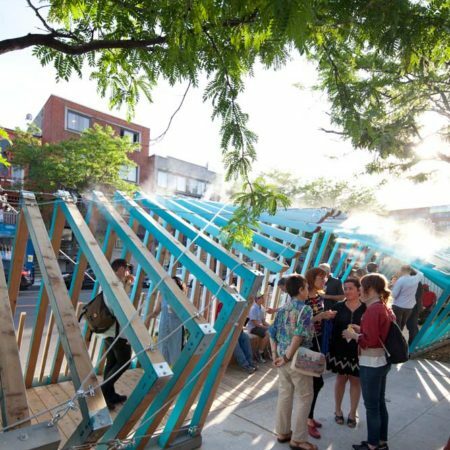 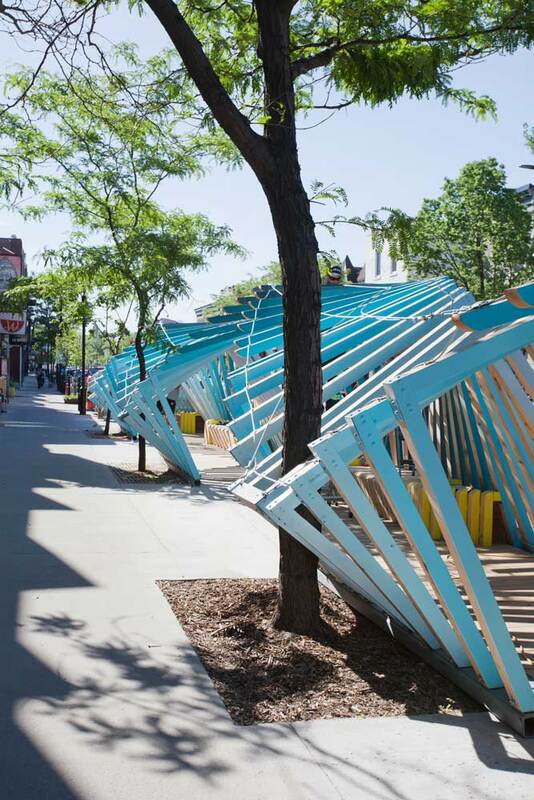 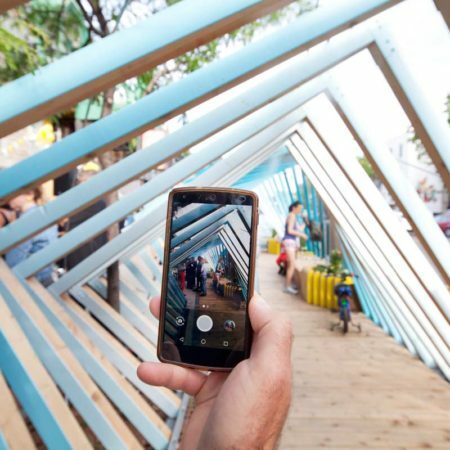 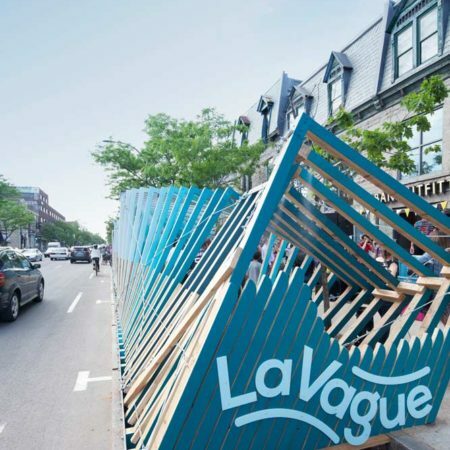 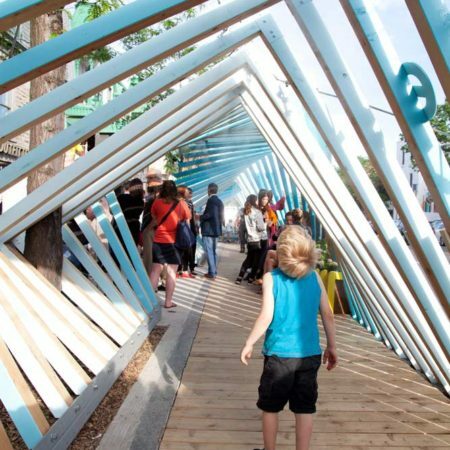 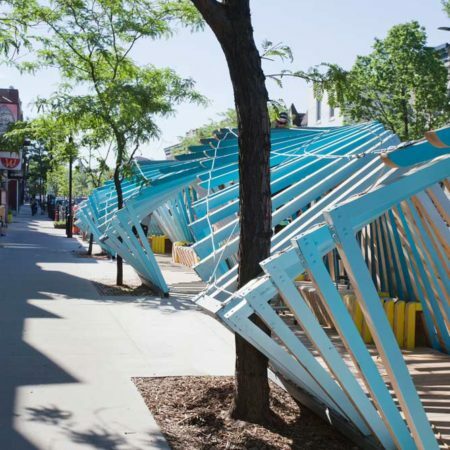 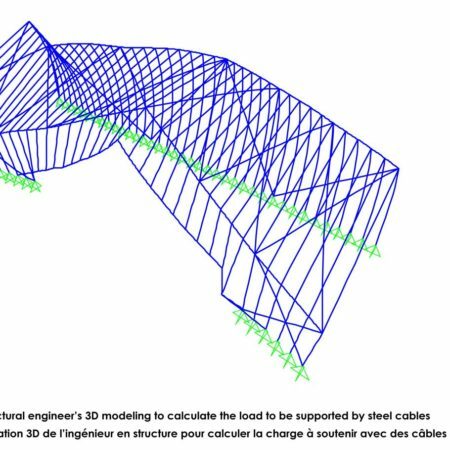 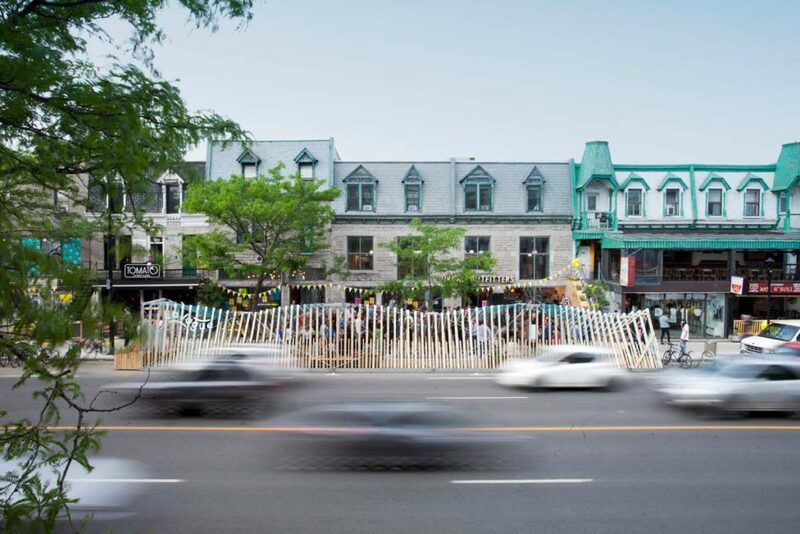 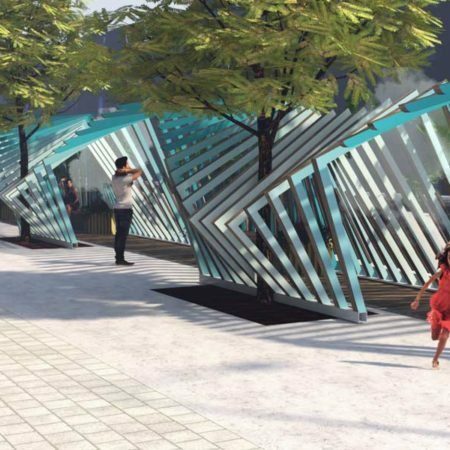 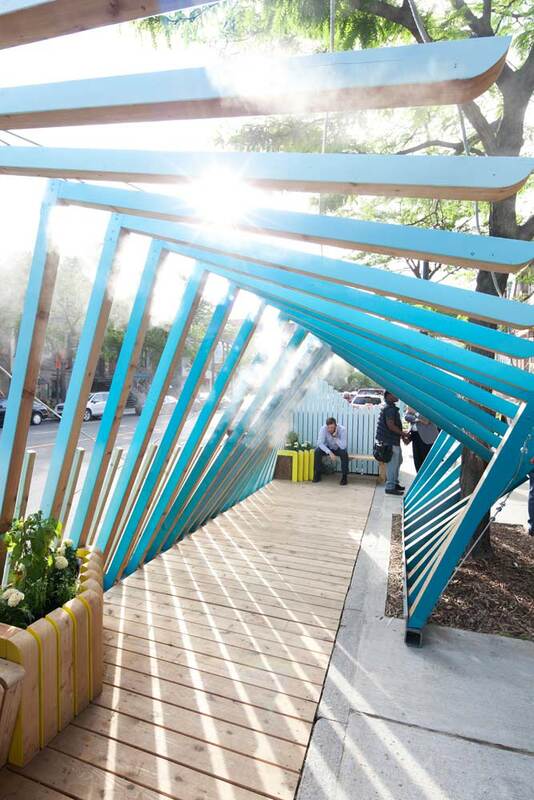 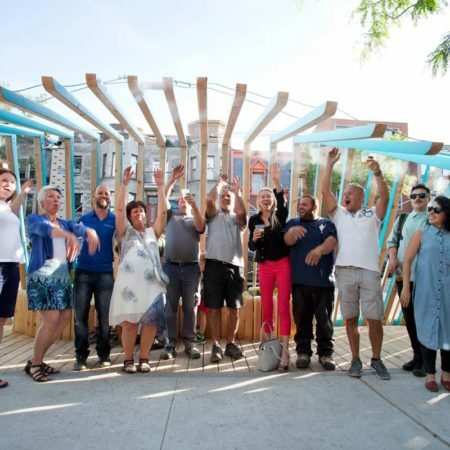 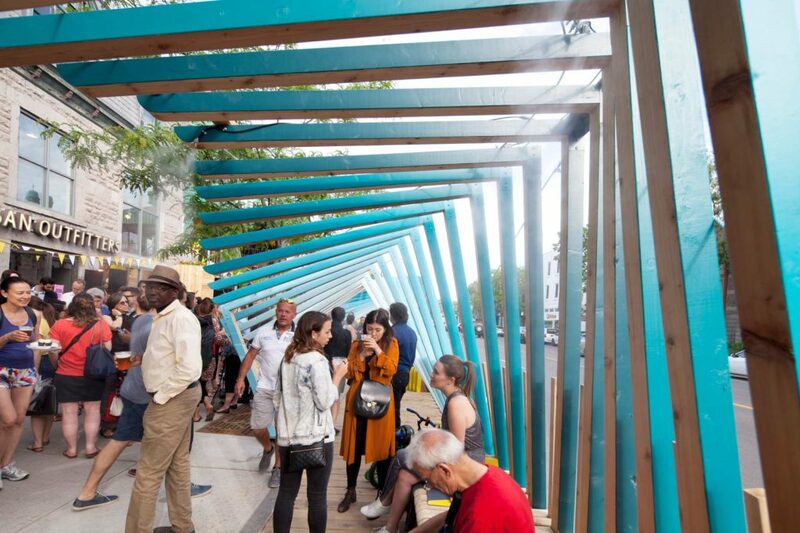 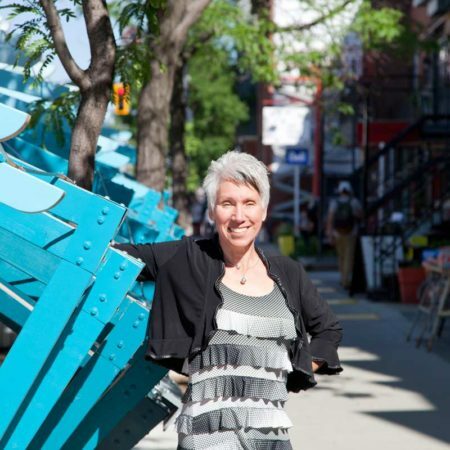 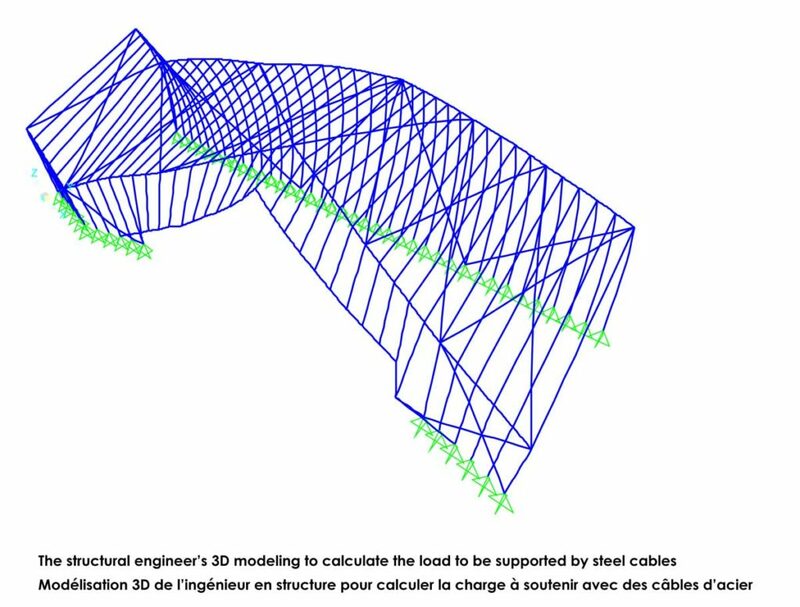 Inserted into five parking spaces on St-Denis Street between Marie-Anne and Rachel, La Vague (The Wave) is 74 wooden frames that rotate in three degree intervals, suggesting the motion of a wave hitting the pavement. 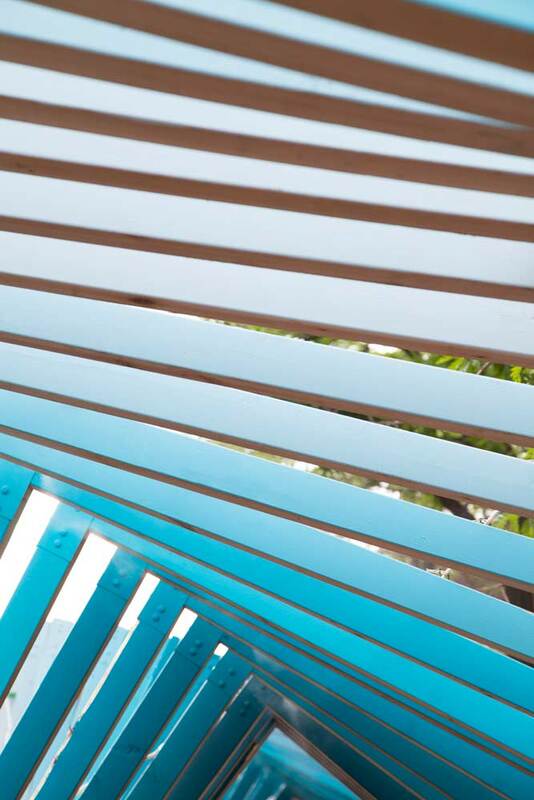 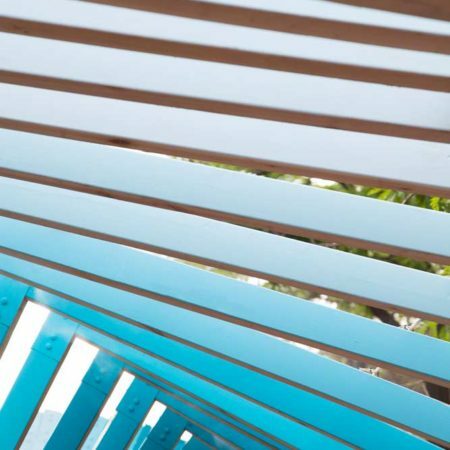 The seven shades of blue used in this artistic installation are reminiscent of a wave’s colours seen in daylight. 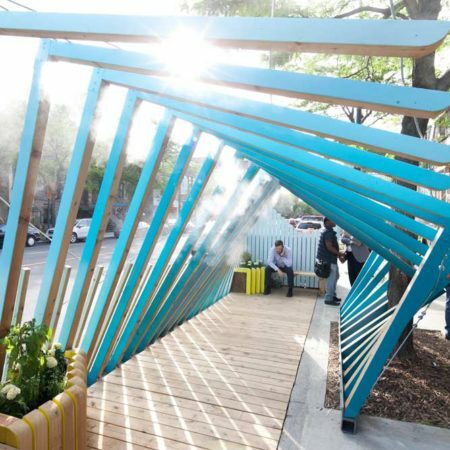 Forty misters, integrated into the structure, are activated by a magic eye, offering an instantly refreshing sensation. 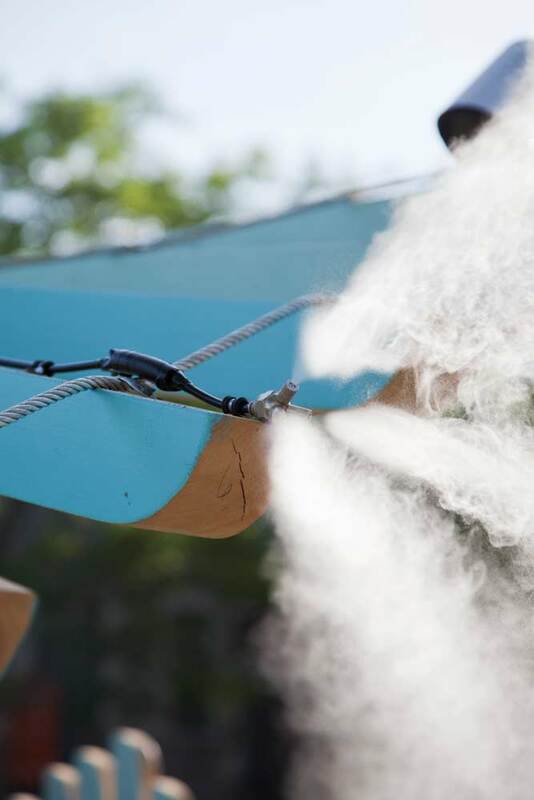 This feeling is created by a rise in the percentage of humidity in the air that decreases the ambient temperature, all without a single water droplet. 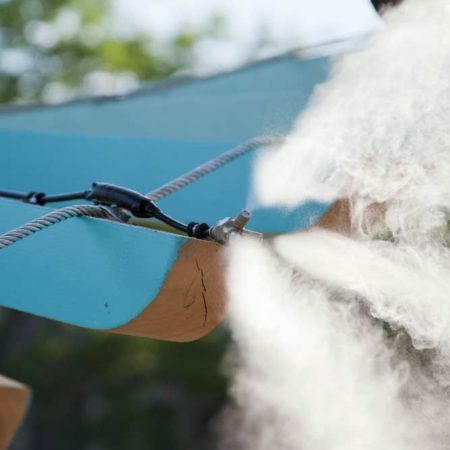 The misting system consists of 45 nozzles that use 0.0222 litres of water per minute. 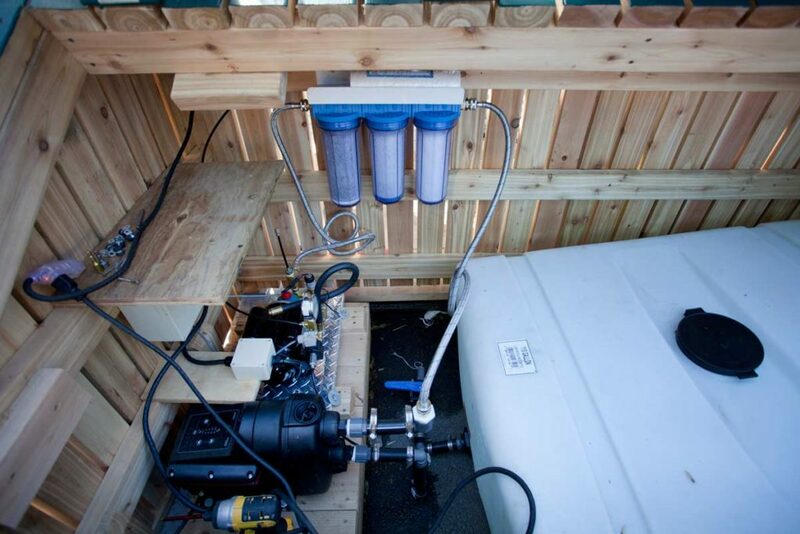 The cistern holds 415 litres (110 gallons) and provides enough water to last for one 12-hour day of use. 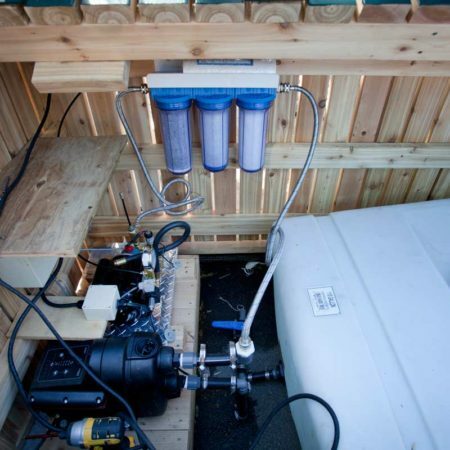 A rain detector allows the system to be turned off and prevents the wasting of water. 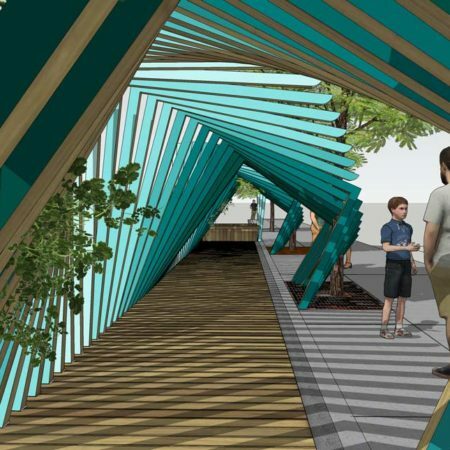 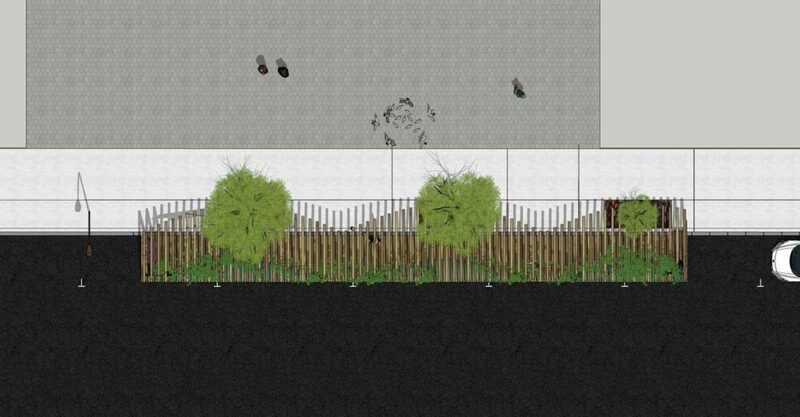 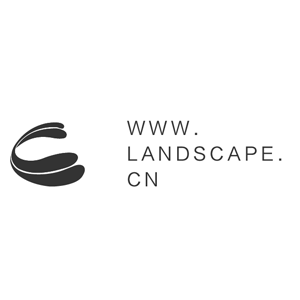 In the concept phase, Arcadia Studio landscape architects decided to take an artistic approach for the project and to enrich it with a playful component that would generate an action-reaction effect. 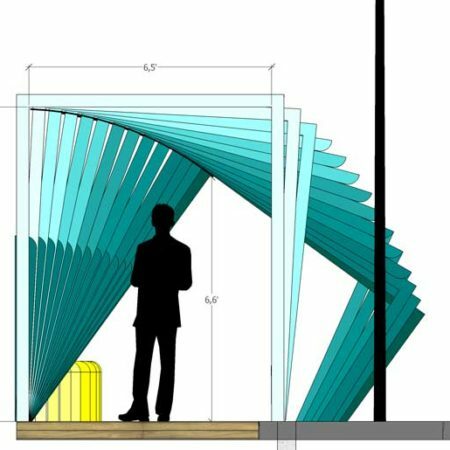 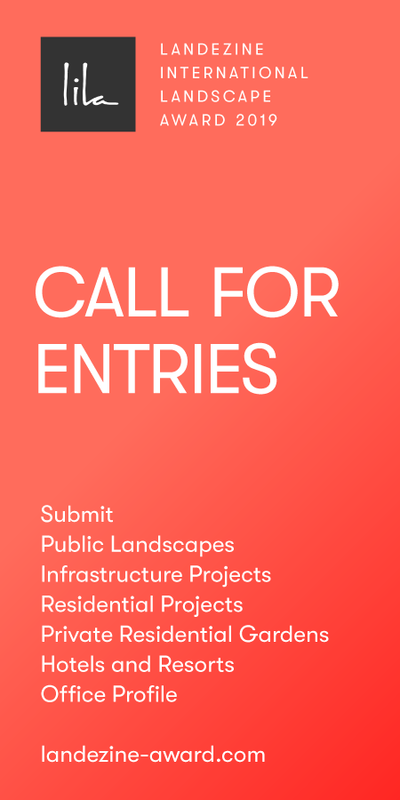 Being in the form of a corridor 2.5 metres wide by 22 metres long, the idea of energizing the passage by movement, – recalling the long tunnel of a wave – has emerged as the key element of the installation. 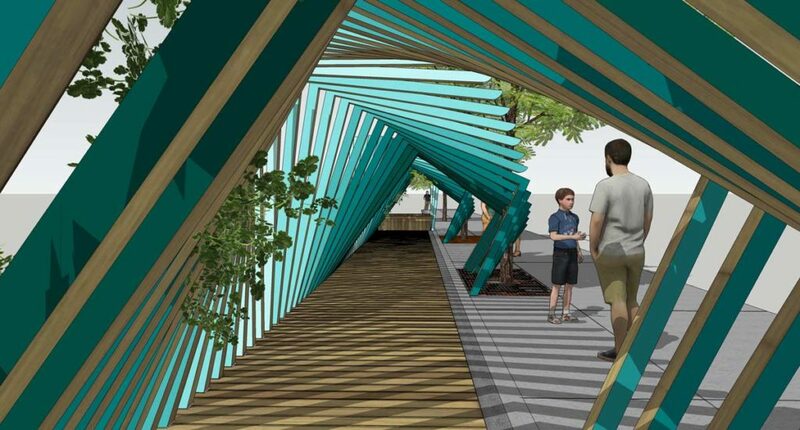 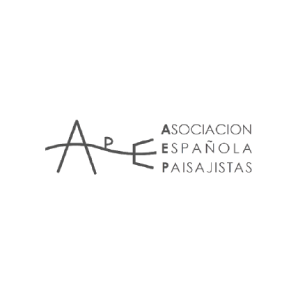 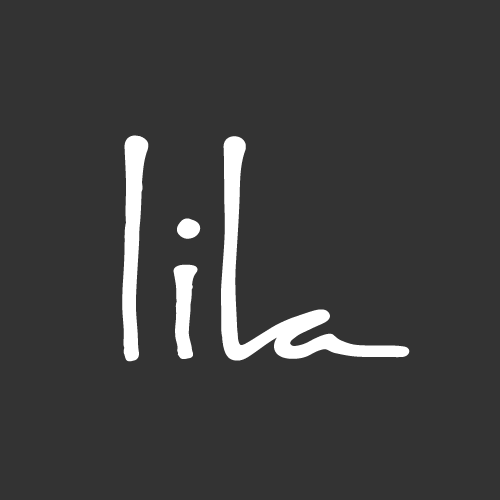 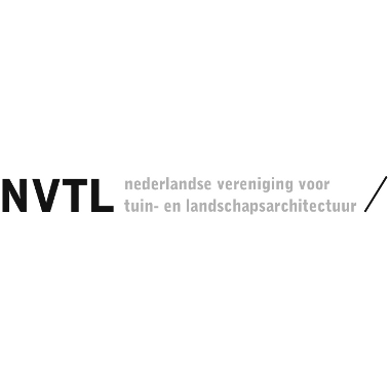 It is the work of an upstream multidisciplinary team that has allowed the design to be pushed further. 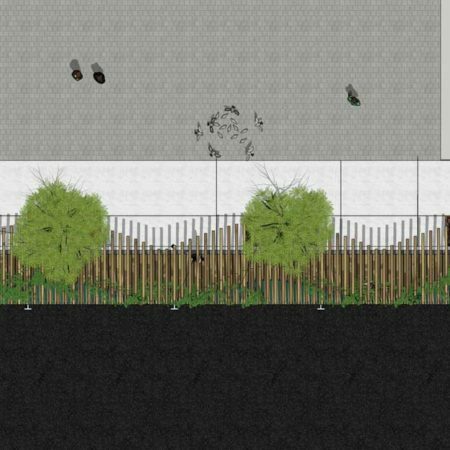 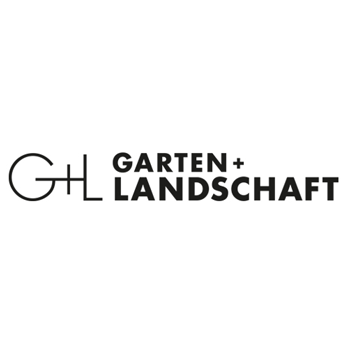 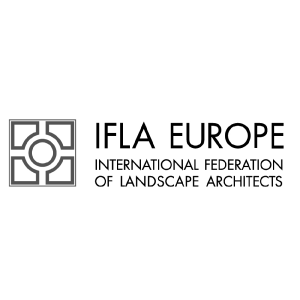 From the beginning, the talent and expertise of the landscape architect, the structural engineer, the recreation and misting experts, and the graphic designer to realize this innovative project were put together.